Cummin Spice | Fragrant, Healthy & Extremely Tasty! Cummin Spice - The Ancient Tasty Seeds Chronicled in the Bible! Isaiah (28:27)... "but the fitches are beaten out with a staff, and the Cummin with a rod". This quote is from the Old Testament, which demonstrates just how long it has been cultivated and used! It documents a traditional way of harvesting the seeds which is still practised today. You'll also find it in the New Testament; in Matthew 23:23. Today most folk, and in recipes books, spell it as cumin, but you'll find some people and cookbooks still use the spelling variation found in the bible. However you spell it, it is still an extremely popular, essential ingredient in many cuisines throughout the world. A member of the parsley family, the cumin plant is a smallish herbaceous annual which grows to a height of between 25-40 cm. The plant blooms with very pretty pinky white flowers, and you can grow it fairly easy for harvesting the seeds. Today we mainly use the cumin seeds in our cooking, but a lot of spices were first used in medicines before they were used for cooking purposes. More general info. There is ongoing research into its medicinal values, including for some serious ailments. 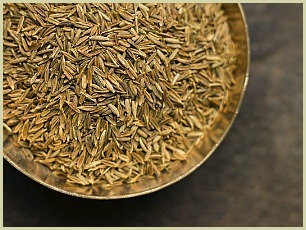 Click for more info about cumin health benefits. Originally native to the Mediterranean and upper Egypt, the seeds have been excavated at a site in Syria that's been dated to the 2nd millennium BC, so it is at least 4,000 years old! The spice soon traveled through Africa, where traders from Iberia and Africa introduced it to The Americas and New World. Whilst the Turk's introduced it to India and Asia. It's now cultivated in many countries ranging from Iran and Africa, through to Mexico, and India. 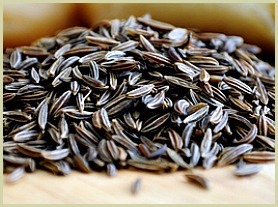 Read more on the history of cumin. Cardamom Info - General tips and advice about the Queen of Spices!